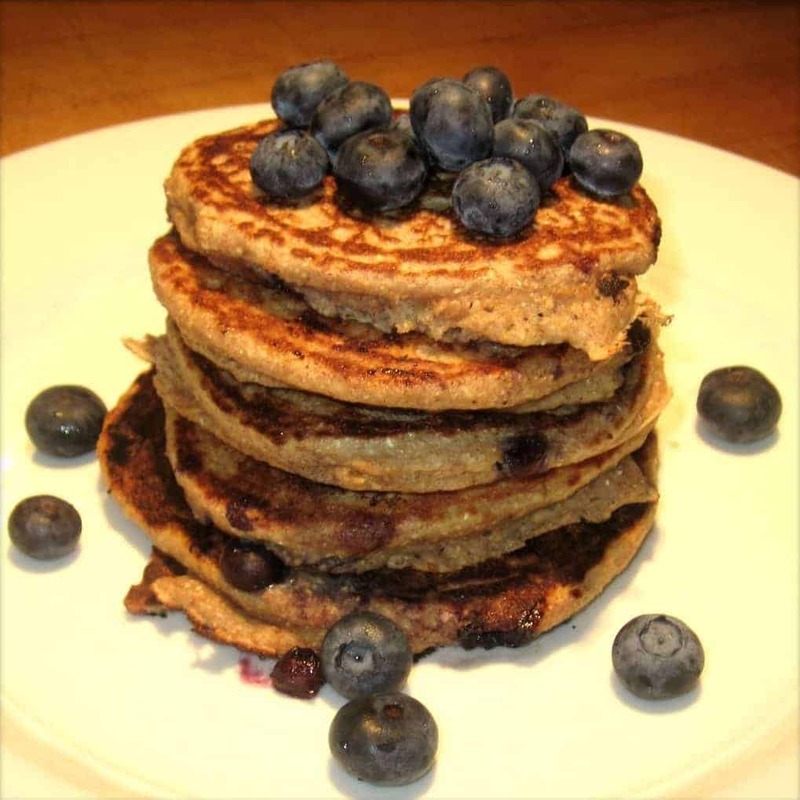 Ripe banana and plump blueberries are the perfect natural sweetener for these delicious pancakes. Ricotta cheese adds a light and airy texture to keep the pancakes moist and fluffy. Blueberry season has finally arrived here in Michigan and I couldn’t be more excited!! As the nation’s largest producer of cultivated bluebush blueberries we take this fruit pretty seriously. Plump, sweet and beautiful – blueberries are not only incredibly delicious but they are one of the most nutritious foods you can buy. Packed in antioxidants and vitamins, blueberries have been proven to help reduce the risk of many cancers, boost heart health, improve cognitive function and much more. What are your favorite healthy blueberry recipes?? Would love to hear from you. In a large bowl, whisk together mashed banana, ricotta and two eggs. Stir in buckwheat pancake mix, cinnamon and salt then begin adding milk until desired consistency is reached. For thinner pancakes, add all 2 cups of milk. Carefully fold in the blueberries then set aside. Heat griddle on high and spray with non-stick spray. 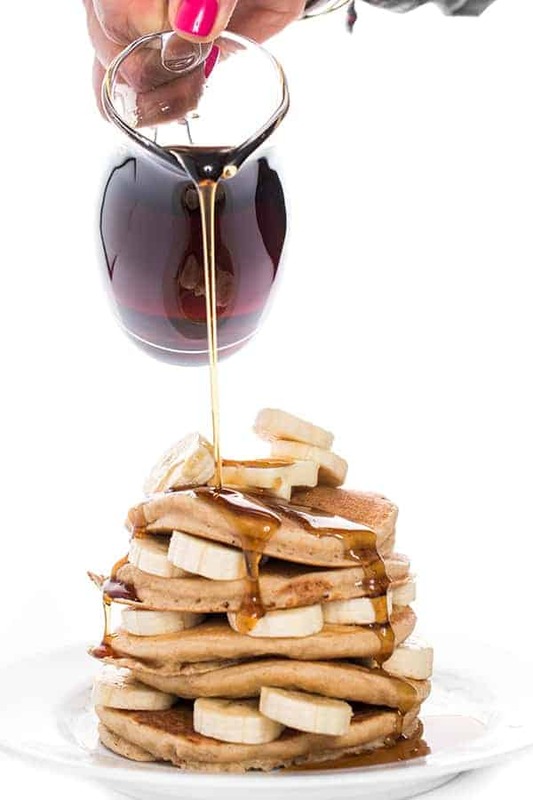 Using a 1/4 cup ladle or ice cream scoop, pour pancake batter onto hot griddle. When bubbles begin to form and pancake is golden brown, flip to the other side. Serve with maple syrup and fresh blueberries. 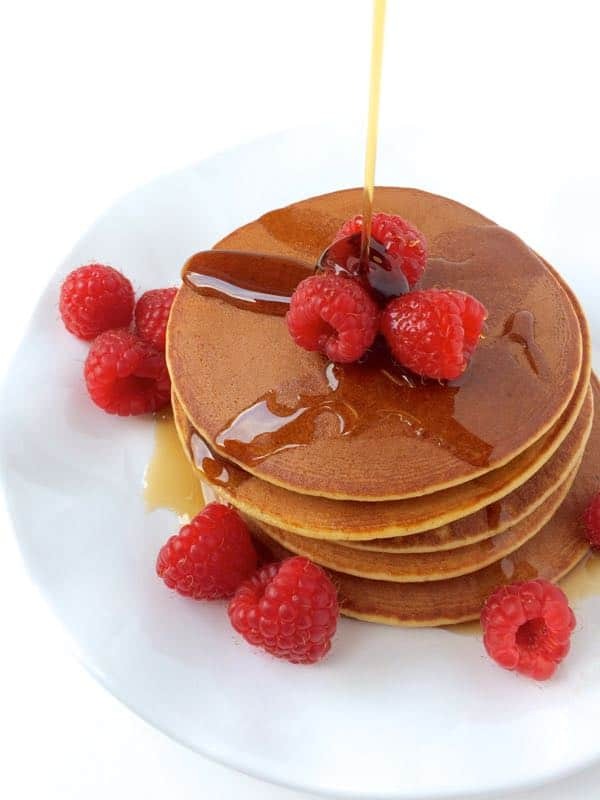 To freeze pancakes, check out Homemade Frozen Pancakes in 5 Easy Steps! That makes me so happy!! So glad you liked them Natalie!! 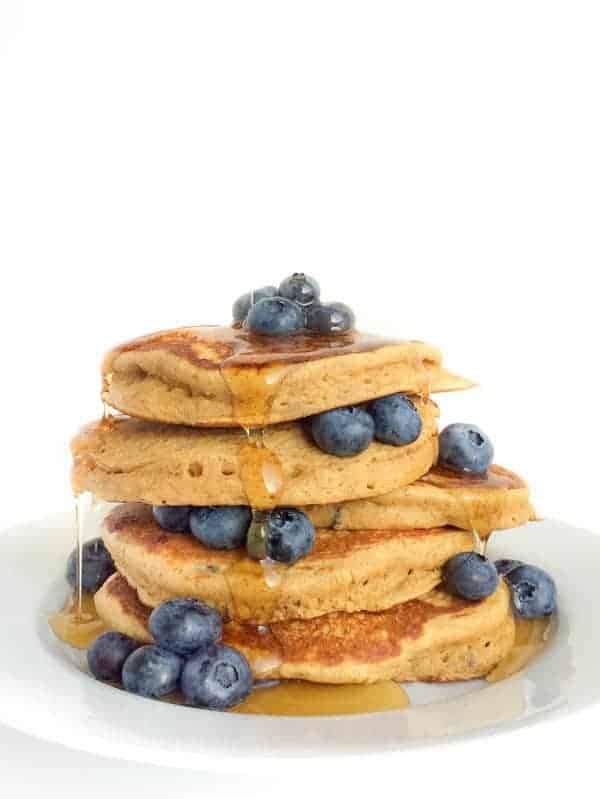 I absolutely adore blueberries and ricotta and Oh my word, Liz, I want to dive into that stack of pancakes! Yum. Yum. Yum! Aww you’re too sweet – thanks Rachel! SWOOOONS! 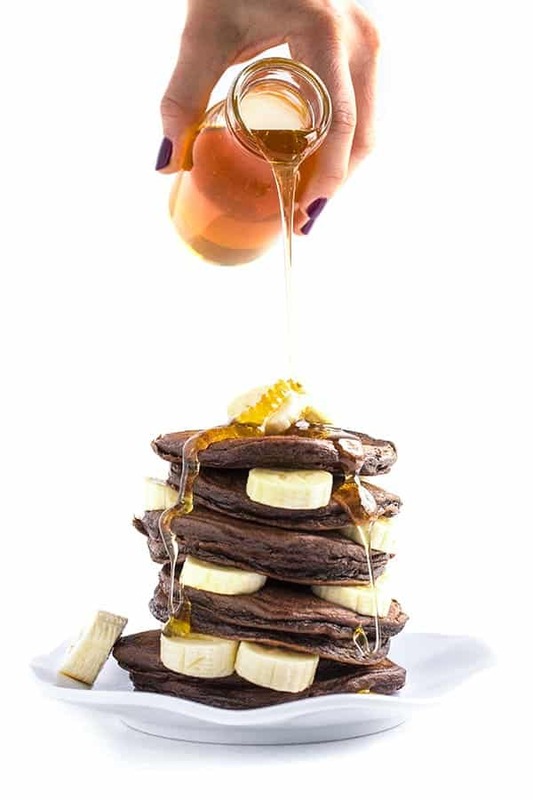 Blueberry pancakes are my favorite, but you just kicked it up with a notch with the added banana and ricotta! I can’t wait to try these! 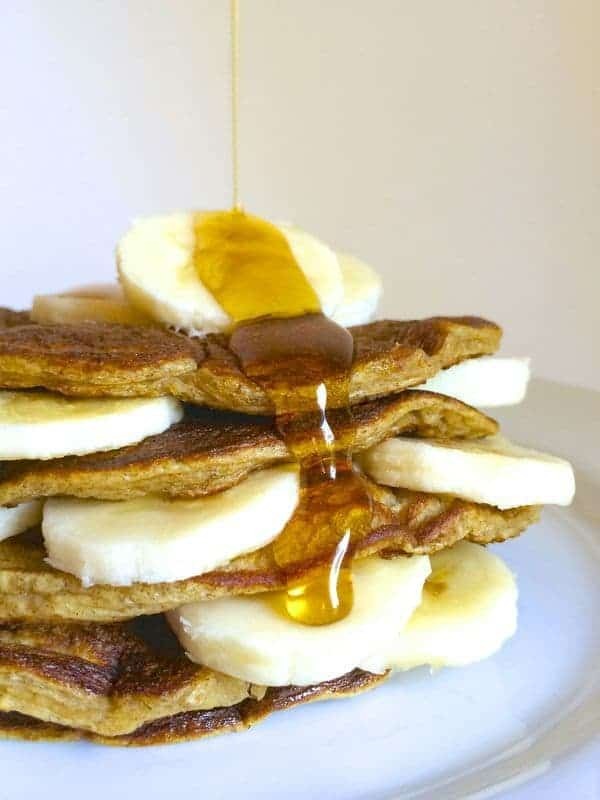 I love using bananas in pancakes instead of sugar! Enjoy! I want to KISS THESE PANCAKES! Every summer, I rejoice in the fact that blueberries are so good for you. This recipe look like a perfect brunch meal. Elephant kale? Ha. Yeah… I’m going to go with a pound of blueberries instead! Or any berries. I’m an equal opportunity berry devour-er. I scored on a couple of gallons of milk yesterday, and with my new cheese making kit plan to try ricotta after I master mozzarella. Master mozzarella, that sounds funny. Anyway, I’m going to run before I walk I’m sure, but the idea of homemade mozzarella on a homemade pizza just appeals to me right now. And the fact that I would like to put the water pitcher back into the fridge, so I need to clear this milk out. I really like bananas and blueberries in muffins, so I’m positive I’ll love them in pancakes. Oh my goodness can I come be your taste tester?!?! Sounds incredible! Amazingly spectacular trio!!! I just bought a humongous tray of blueberries from Costco and always have ricotta and lemons on hand! No lemon in this recipe but lemon would be GREAT!!!! Enjoy Gwen!! Those look so good. I think I could quite easily demolish a whole plate of those just now! Liz, I mean, LIZZZZ!! You made my kryptonite! I love blueberry picking during the summer. Girl you just made me drool. LOL!!! So glad to return the drooling favor!!! I’m still thinking about your steak!!! Mmmm might have to give these a try this weekend! I think you better Jamie! You can’t beat Michigan blueberries. When I grew up in Michigan we went blueberry picking allll of the time and most ended up in my mouth! These pancakes look so tasty! I love that you’re coming to MI this weekend!! Enjoy the blueberries!! Thank you Teighan!! I hope you can try them! Blueberry season is the best! They’re one of my absolute favorites, so inexpensive and full of nutritional benefits! I’d LOVE to use them in these scrumptious looking pancakes, Liz. Have a great weekend! I so agree!! I need to buy more to freeze!! I get so sad when the season is over! These look amazing! I actually can’t get this out of my head so I’m making a frozen waffle with maple syrup and berries. Closest I can get with minimal effort! I love that you can’t get it out of your mind!! What baby wants baby gets!! I just ran out – I want to buy more to make your fritters!!! This stack is making me drool! I love hearing that!! :) Drool away!